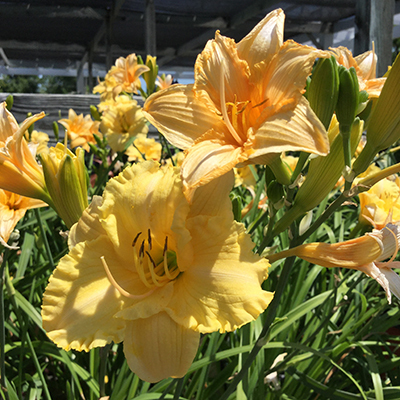 Reblooming Daylilies | Faddegon's Nursery, Inc.
Jun 30, 2016 | Perennials, What's New? What could be better than daylilies blooming in your garden? Daylilies reblooming in your garden! Do you remember seeing all of those orange and yellow daylilies coming up along country roads in mid-summer? Some of us grew up knowing them incorrectly as “tiger lilies”. I sure did. Daylilies have come a long way since then! Hemerocallis fulva is the orange lily of our youth that we still see and many of us have in our gardens. Because of their hardiness, the genus has been naturalizing vast areas since Colonial times when they were brought from Europe. Then the changes and improvements began. More colors, more flowers and longer blooming periods were the goal. The man most responsible for achieving these objectives? Darrel Apps. While working at The University of Kentucky, Apps realized the potential of hemerocallis and started to experiment by hand pollinating. The result is the production of some of the most exceptional modern daylilies. As of now, Darrel Apps has introduced 215 daylily varieties including the Happy Ever Appster™ daylilies in conjunction with Centerton Nursery of Bridgeton, NJ and a number of the Trophytakers® as well. Both of these lines are by far the most reliable and popular daylilies available. Happy Ever Appster™ daylilies include the “Returns” line. Reblooming means they will bloom for at least 6 (most bloom longer) weeks compared to the 3 weeks of the old fashioned varieties. The flowers themselves also last longer than the 6 hours of the older daylilies, remaining open until evening. Daylilies now have a presence in almost every perennial garden often surpassing other perennials with their reliability, ease of maintenance and ability to bloom for weeks and weeks with big, beautiful flowers. With so many color variations there is a daylily for everyone! Blooms are rounded with wide, recurved back-petals of brilliant hot-cherry red with a lemon throat and grass green tonsils. 22″ – 24″ Tall x 14″ – 16″ Wide. The blooms are a bright rose pink, with a deep rose eyezone and yellow throat. 14″ – 16″ Tall x 12″ – 14″ Wide. Hardy Zones: 3 – 9. Stunning shades of pink and yellow and crimped ruffled edges in bright yellow.